While Snapchat is still in its infancy on the social media lifecycle, it has already produced its own crop of stars. These people make up the rather small, but fast-growing niche of Snapchat artists, who use their finger or stylus as their tool of choice to create masterpieces on the communication platform. The catch? Their masterpieces only last from 10 seconds to 24 hours. I had the opportunity to sit down with OperAmericano, a relatively new Snapchat artist, who estimates that she has about 20,000 followers (this estimate is based on the number of people who view her stories combined with direct replies and messages since the platform has no way for you to see the actual amount of followers you have). OperAmericano did not always have the intention to be a Snapchat artist; she would just draw something in order to make her friends laugh. With some of her more elaborate masterpieces, she would post them on Instagram. At the beginning, she didn’t have many followers, but a fellow Snapchat artist, Evan Garber – known to the Snapchat world as emgarber – liked one of the photos. She found his profile and found out that he was a Snapchat artist. Other Snapchat influencers like Shonduras and Branden Harvey have helped to shape the positive message she wants to communicate to her fans, as well as the adventurous flair to her stories. “I make a point to keep every story positive,” she said. OperAmericano’s mission as a Snapchat artist is to spread a positive message and to not put anything negative out there to her fans. She points out that Harvey does this too, which has inspired her to continue to spread positivity to her followers. From Shonduras, she is inspired by his sense of adventure, which influences the adventures she puts forth in her stories. “I knew that I wanted to be an adventurer,” she said. “That it was going to play into whatever I ended up doing. OperAmericano also finds inspiration for her snap stories from video games (she’s a gamer), TV shows such as Dr. Who, and from Disney characters, who make up the majority of her media-related snaps. 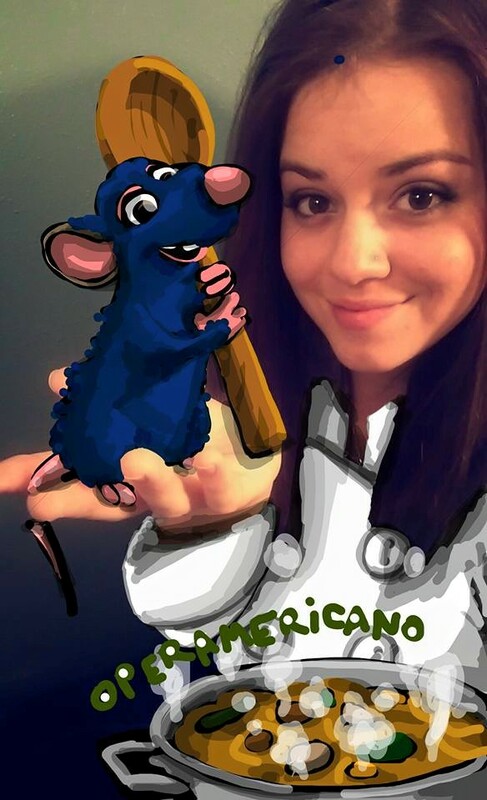 One of OperAmericano’s snaps inspired by Pixar’s “Ratatouille.” Photo courtesy of OperAmericano. “It’s important to bring your interests in your content because it shows,” OperAmericano said. In terms of her ideation process, she often tries to aim to reach a particular climax or conclusion in her story and center her snaps around that. If there is something that inspires her at the time, she will try to incorporate that into her stories. As for the creation, OperAmericano creates her creations with one tool: her finger. The reception for her art has been well-received by both fans and artists alike. In her own way, she’s inspired other Snapchat influencers. Since starting her own her weekly segment, “What’s that tune Tuesday,” many other influencers have followed suit by creating their own weekly series. For OperAmericano, Snapchat has showed her a sense of community and how much of a positive influence she can have on some of her followers. “The biggest part is the friends I’ve made through it and the positive effect I have had on some of my followers who need something positive in their day,” she said. 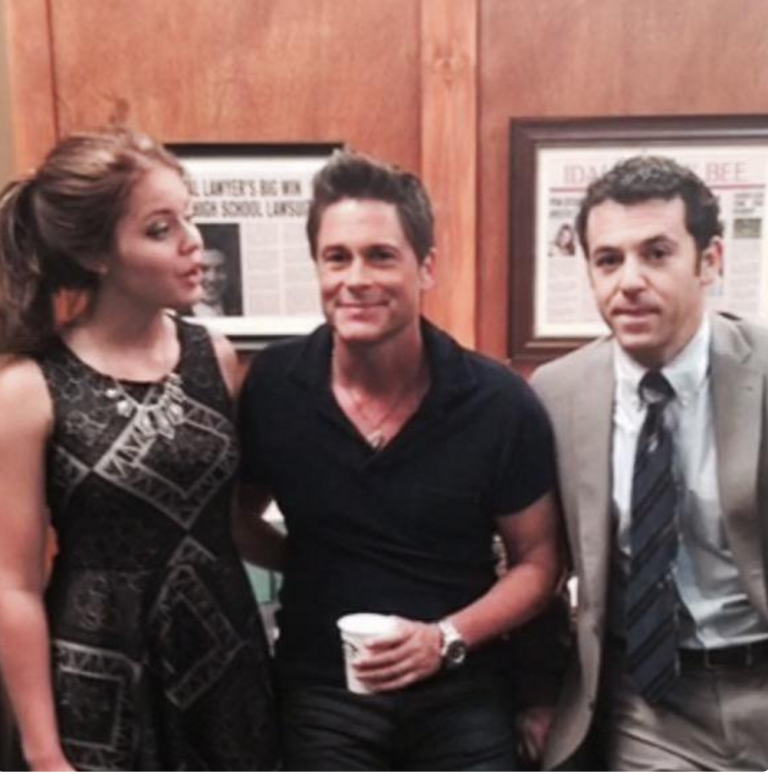 OperAmericano on the set of “The Grinder” with Rob Lowe and Fred Savage. Photo courtesy of OperAmericano. Disney was OperAmericano’s first campaign, recommended to the company by Shonduras. She got to learn alongside him, which helped her a lot in successfully running the account. Today, Snapchat is being utilized by some as a platform for creative expression rather than just a communication outlet. The platform has so many dimensions to it, making it possible to use it for more than just chatting. OperAmericano does not see herself stopping Snapchat anytime soon. She’s just getting started making a name for herself in the Snapchat community. And they aren’t the only ones taking notice. It’s only just the beginning for this young creative. Add OperAmericano on Snapchat: operamericano.